Microsoft makes good hardware. Why spoil it with bad software? Good news! According to reports, Microsoft is preparing to launch the Surface Mini after all. That's great news for anybody who wants a tablet that doesn't run Windows properly and costs as much as Apple kit. Perhaps it'll come with a free chocolate fire guard and a stink bomb for use in space suits. Too harsh? I don't think so. 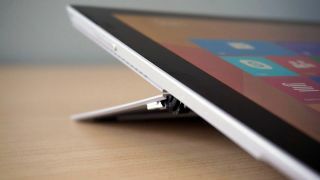 Unlike the big Surface, which has won a legion of fans, the Mini will be hobbled from the outset: instead of the full Windows you'll get on normal Surfaces and on other Windows tablets, the reports say it's going to be saddled with FrankenWindows, aka Windows RT. So what's the selling point here? It won't be cheap - and it certainly won't be as cheap as the army of proper-Windows tablets that are already marching towards a retailer near you. It isn't proper Windows, which means it's of limited usefulness. As we said back in April, it's an obsolete OS, something the 8.1 update hasn't really addressed. And because it doesn't run normal Windows apps, it's entirely dependent on the selection of apps in the Windows Store. That's better than it was, but it's still far behind Android and iOS. Why launch a device that's destined to fail? It doesn't make sense. Assuming the reports are correct and it hasn't been canned, the Surface Mini has already been delayed twice: it was originally expected in 2013, and it was pushed back again until 2014. If Microsoft has any sense it should push it back again for one very good reason: Windows 10. Windows 10 addresses the fundamental problem with an RT tablet, which is of course Windows RT. From next year it won't be on offer: instead there will be one Windows on Intel and on ARM, with code working across platforms. That'll remove the confusion that's made Windows RT as welcome as an angry bear at a children's party. The other reason to wait is that the supposed killer app for the Surface Mini isn't ready yet. The touch-first "Gemini" version of Office is still under development, and while it's been talked about for years the best guess for its release date is early 2015. There's no doubt that Microsoft can make nice hardware, and I'm quite sure that the Surface Mini would be a good device. If Microsoft released it with Windows 10 and the Gemini version of Office, it would probably be a hit. But to release it now without the touch-based Office and running an OS nobody wants, Microsoft will only sell the Mini to masochists.